I’ve received a lot of cool Christmas presents over the years, and in fact, my wife is an “exceptional” present-giver. Always finding something that is a tremendous gift that shows she has put a lot of thought and energy in finding the perfect gift. Watching me train like I never have before for New York City, and now taking that up another notch for Boston this Spring, she has seen me work harder, pushing myself to my limits to take one more crack at that elusive sub three-hour marathon. She has also seen me sore and beaten down from tough workout after tough workout. When I opened my “big gift” this year, I was surprised to find a pair of Juggler Knickers from 110%. 110% was founded by a diverse team of passionate athletes and visionary entrepreneurs dedicated in their search for ways to play harder and recover faster. With more than 30 Ironman competitions, 100 marathons and too many triathlons to mention, the people of 110% have put in the hard work on and off the field that’s resulted in the most innovative and effective compression gear available anywhere. 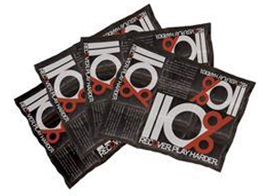 Simply put, through extensive research and innovative technology, they help athletes play harder and recover faster. Their products marry two of the “big four” when it comes to recovering from a tough workout. Rest, Ice, Compression and Elevation. In fact, they cover the two toughest components, compression and ice, leaving the rest and elevation up to you. I think we have all been there before. A bag of frozen peas stuffed down our sweatpants to get ice on that quad, hamstring or knee. Another stuffed in a sock to get ice on a niggly ankle, still another on a sore hip. Despite sitting motionless or laying prone on the floor, keeping ice on the exact spot required can make 20 minutes feel like a lifetime. Well 110% has a series of compression products that not only provide your musculature a great set of compression pants in three lengths (full length, juggler knickers – just below the knee and shorts). The compression pants have strategically placed “outer pockets” to hold their “Ice Sheets”. The ice sheets are reusable, flexible, and non-toxic. You simply cut the packets to size, run under water for 30 seconds and place in the freezer. When you’re ready for cold treatment, slip the sheets into the gear’s specially designed pockets. Your entire set-up comes in a reusable thermal bag that will keep your ice sheets cold for up to 6 hours, so you can take your ice with you easily and get recovery underway instantly. The sheets can also be microwaved, if heat therapy is called for. My wife purchased the Juggler-Knicker length compression tights for me that cover my hips, rear end, hamstrings, quads, and knee areas. After Thursday’s (Down)Hill Repeats, specific in preparing for Boston I took a quick shower while my packets were freezing and slid into the compression pants. The pants themselves are tremendous. You can tell that a great deal of testing and design work went into placing areas of great flexibility where needed, as well as tight compression on the muscle groups. After I slipped the ice packs into the pants, the entire system was taken up to another level. The packs stay put, keep ice on the target areas, while the compression gear is comfortable allowing for full movement up and down stairs, in and out of the car, even at the auto-parts store where I was having a new battery put in my wife’s car. The Rest and Elevation aspects of your R.I.C.E. treatment is up to you – but as for the Compression and Ice elements – I suggest you give the folks at 110% a try. Afterall, everything else is just tight clothing. I’m glad you like the product! Just in case you are interested though, it was invented by one person and not a team. My name is Steve Petiit and I invented the product after sitting in an ice bath in 2005. I sold the company to the folks at 110% 2 years ago. They have made some significant improvements, but I thought you should know the truth of how it was founded. I noticed that you did this review over a year ago. As I am thinking of purchasing compression garments, I am interested in knowing; how have your jugglers knickers held up through constant wear and washes? Also the cold packs, do they have to be replaced often over time? Are there any issues with using the packs for heat as well as for cold ( maybe the extreme fluctuations between temps wear down the packs quicker or something similar?) ? I’m sorry for all of the questions! I try to be very thorough before I decide to spend my money on products that are going to be worn for long periods of time. Thanks in advance! Hi Amber, thanks for the visit and the message! I am happy to help here as they remain one of my favorite all-time products. I would say that they have been through 50-60 washes at tis point, I never put them in the dryer, just allow them to air dry and they look like they did the day I opened the package. Really a quality product. The cold packs do over time compress, but i simply run them under water again and they bounce back nicely. Essentially they just need to be rehydrated. After about 6 months I replace them with new. The garment comes with enough packages to do this 3X or so before you would run out and you can purchase new ice packs from 110% or at a retail location at a very low cost. You could also use other cold packs if you like as long as they are the right size. The 110% sheets are nice as you can cut them to size. Bigger for quads and hamstrings, smaller for knees and shins. As for heating, I’ve never tried it even though I know that you can. 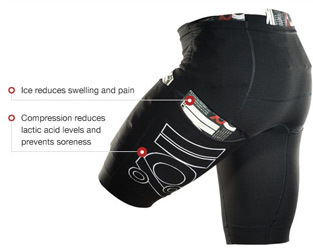 I just have not had a cause for it yet as I am using the compression post workout and prefer cold therapy. I hope that helps!